Hamilton's first use of a metal bracelet was in 1931 with the Palisade and also the Clinton, but the trend didn't last too long. The Clinton was unique in that the bracelet was integral to the bezel. The Palisade's bracelet was removable but the lugs that remained were fairly close together - about 12mm, in fact. Fast forward 30 years and Hamilton was back on the bracelet band wagon. 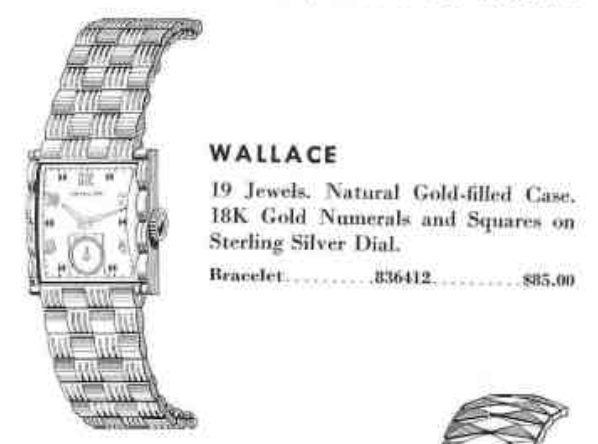 One of the models to be offered only on a bracelet was the 1954 Wallace. It was produced for two years. What's especially interesting about the Wallace is the bracelet is perfectly matched to the bezel. In fact, you can't really tell where one begins and the other ends. The grooved pattern on the bezel doesn't match between the top and the bottom so it would be tempting to call the model an asymmetric - although it's not really considered one. The Wallace was made in 1954 and 1955 and has a 12/0 movement. It's breaks with the tradition of putting 17 jewel movements in 10K gold filled cases, as the Wallace was initially offered with a 19 jewel 753 movement. If you find a Wallace with a 770 movement, it's probably a 1955 model. You don't tend to come across the Wallace too often in the wild - but they are not unheard of. The real trick. is to find one with it's original Kestenmade bracelet - as I don't think you'll find that bracelet unless it's attached to a Wallace. I recently landed a Wallace project watch and although it's actually in very nice condition, the spacing between the lugs is only about 12.5 mm (or half an inch). Such a narrow strap means it will probably be better suited to a woman by today's standards, once it's finished. The crystal on my watch is a little beat up but other than that, and the need of a good cleaning, this watch is really nice. The case back is in great shape - I suspect the bracelet on this watch broke and the watch spent most of it's life in a dresser drawer. Looking at the watch from the side, you can see the lug design is short and meant to be inside a close-fitting bracelet. Whatever strap I will use needs to be thin and have a thin spring bar too. Although the dial is fairly small, it's actually quite thick chunk of sterling silver since it has to accommodate the sunken second hand register. I can tell by the crispness of the printing and general look of the finish that this is an original dial and a little light cleaning will make it look great again. The 753 movement looks just a like 770 with the exception of a few missing cap jewels. The 770 is shock protected too - so that was a big improvement over the 752, 753 and 754 grades. There's no guesswork involved in identifying this particular model... the name is right there in the case back. If you don't see Hamilton Watch Co, etc inside the case back as shown below, there's a good chance the model is not authentic. 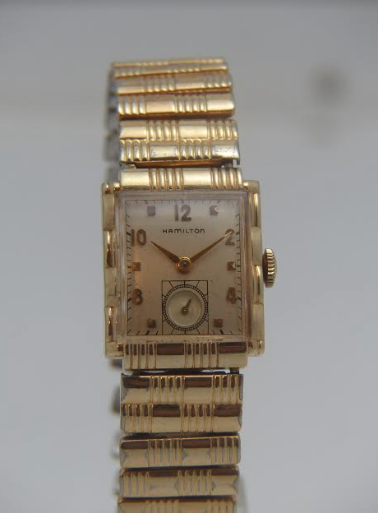 Jewelers often recased Hamilton movements, especially on ladies models. I think it's safe to say that this white alloy mainspring is a long way from being "set". These white allow mainsprings are considered "lifetime" mainsprings but that doesn't mean they can't break. This one will be cleaned and reinstalled. A new glass crystal will be a nice improvement over the old plastic one. This model takes a "cylinder" as opposed to a flat crystal of the same shape. A cylinder is sort of arched and thick so it will stands well proud of the bezel - as shown below. Everything is completely disassembled, cleaned and dried before being reassembled with fresh lubricants. The reassembled movement is nice and shiny. The dull haze it had before is now gone and the watch is ticking away with vigorous motion. No one can complain about this performance... if anything I may need to speed it up a smidgen as freshly overhauled movements tend to slow slightly as they settle back in. I happened to have a nice period-correct vintage strap and I trimmed the ends just enough to get them to fit in between the lugs. This is an unusual looking watch without it's bracelet but it's still quite attractive. Here's what it would look like with an original bracelet. I like the watch the sides of the bezel have curved arches that echo the curved links of the bracelet. It's a very small watch though and could easily be worn by a woman, I bet.